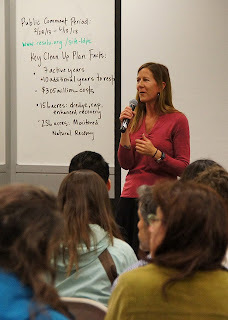 The CEEH and the UW Superfund Research Program (UW SRP) filled the Allen Library Research Commons on April 29th; attendees included UW students and staff, a Duwamish tribal member, staff from EPA, Ecology, the City of Seattle (representing the Lower Duwamish Waterway LDW Group), and the Duwamish River Cleanup Coalition (DRCC). 70 people listened to EPA, Ecology, the LDW Group, and DRCC representatives give their perspectives on EPA's Duwamish River Superfund Cleanup Proposal. Each presenter was given 5 minutes. To assure that each group had equal time, the audience applauded them off the podium when their 5 minutes was up. You can view videoclips of the presentations on the UW SRP web site. 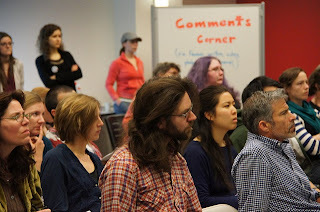 Photos from the event are also available on Flickr. Participants listen to panel presentations. In 2001, a 5.5 mile long stretch of the lower Duwamish River was declared a federal Superfund Site. It is one of the most toxic hazardous waste sites in the United States. 41 different toxicants contaminate the river; the contaminants of highest concern are polychlorinated biphenyls (PCBs), dioxins and furans, carcinogenic polycyclic aromatic hydrocarbons (cPAHs), and arsenic. The contamination is in the river bottom sediment. Six of the most contaminated areas were designated as Early Action Cleanup Areas. These include Slip 4 near the former Boeing Plant 2; Terminal 117, site of former businesses Duwamish Manufacturing and Malarkey Asphalt Company; Boeing Plant 2 where B-17 bombers were manufactured during World War II; Jorgensen Forge; Duwamish Diagonal, upstream from Harbor Island; and Norfolk Combined Sewer Overflow (CSO) near the south end of Boeing Field. Cleanups at Slip 4, Duwamish Diagonal, and Norfolk CSO have been completed. Including the Monitored Natural Recovery brings the the total cleanup area to 412 acres. The estimated cost of the Proposed Cleanup Plan is $305 million. Active cleanup would take 7 years. Monitored Natural Recovery would take an additional 10 years. Dredging is the most thorough and most expensive cleanup method, and monitored natural recovery is the least thorough, least expensive, and least certain method. EPA estimates this cleanup plan will reduce the risk associated with eating contaminated fish and shellfish by 90%. The Washington State Department of Ecology is responsible for source control and has developed a strategy to mitigate and prevent pollution from upstream roads, residences, farms, forests, and industry from entering the Duwamish River. Upstream source control must be completed before the Superfund Cleanup begins, to prevent new pollution from recontaminating the river. Kelly Edwards moderated the event. At the meeting, the representatives had different perspectives on the cleanup. EPA feels they have done a thorough study and that their cleanup proposal will bring about a good cleanup in a reasonable time frame. Ecology stressed the complexity and the importance of preventing upstream pollution from recontaminating the river. The LDW Group feels the EPA goals for how clean the river can be are unachievable since industry will continue on the river, pollution will enter from upstream no matter how good the source control, and Puget Sound itself has pollution. The Duwamish River Cleanup Coalition, on the other hand, feels the cleanup proposal doesn't go far enough to assure a thorough cleanup that is certain to last. They feel strongly that the cleanup should be done right so it doesn't have to be done again down the road. All the presenters encouraged everybody to make a public comment by June 13th. The comment period is already half over, and this is the only chance for the public to speak up and influence the EPA's Cleanup Plan. EPA must answer all the comments in a public document. The Duwamish is Seattle's only river, home to 2 historic neighborhoods, South Park and Georgetown, and fishing grounds of the Duwamish, Suquamish, and Muckleshoot Tribes. Seattle and King County residents will help pay for the cleanup through our tax dollars. Now is the time to tell EPA what you think about the Proposed Cleanup.